Homecoming week is filled with school spirit and memorable moments. From pep rallies to football games, parades to dances, students look forward to Homecoming week. East kicked off Homecoming week, starting Monday the 24th with the Opening Assembly. 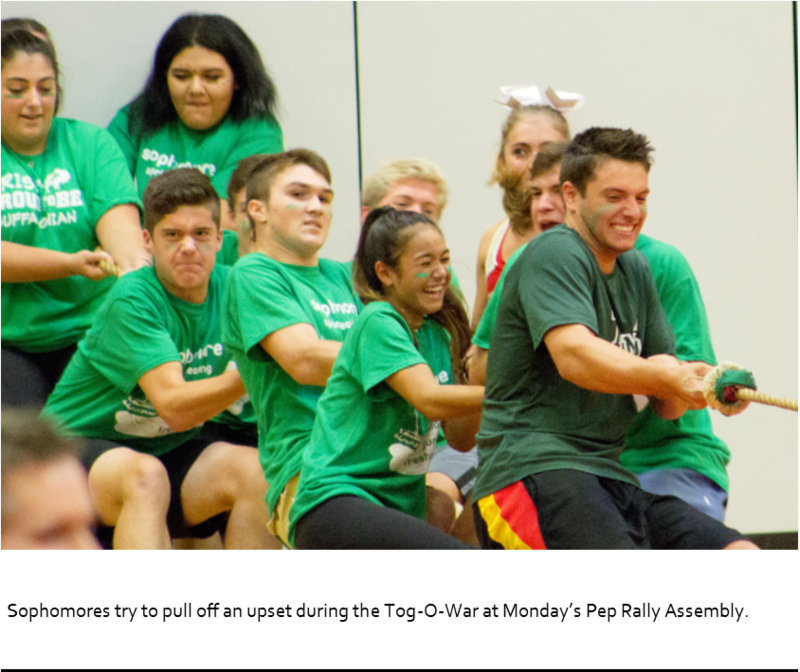 It was an afternoon filled with fun games; seniors swept the musical chairs competition, and in a stunning upset after a technical foul by the juniors, the sophomores faced the teachers in an intense game of tug of war. Ultimately, the teachers were victorious. All of last week, the senior class voted on who the nominees were to be for Homecoming King and Queen. Rachel Steffan, Nya Heron, Anna Bella D’Amico, Sierra Gibson, and Madelyn Lane were nominated for Homecoming Queen. Colson Skorka, Clayton Osborne, Robert Korman, Karthik Kannappan, and Anthony Sauer were nominated for Homecoming King. Voting took place all of Homecoming week with the winners to be announced at the final assembly on Friday, September 28th. Tuesday brought about ER day, where students attempted to come up with their most original costumes ending in an –ER, and the school was filled with wacky creatures. Some popular favorites were the religious sister, the grandmother, the cadaver, and the spider. Tuesday afternoon was the Care Walk and unfortunately, due to the weather, it was moved indoors. The students paid five dollars to walk around East, through the Commons, up the stairs at the end of Student Street, and even past the pool. All of the proceeds benefited Roswell Park, and seniors could receive government hours for donating and participating. Wednesday was America Day. East students were decked out in their red, white and blue; people wore flags, and painted their faces – it was a great testament to our patriotic spirit. Bubble soccer was canceled because of unsafe conditions and poor weather. Thursday was theme day, each class dressed as part of the Seasons on Paradise theme. The freshmen were winter, sophomores were spring, juniors were fall, and seniors were winter. The possibilities are endless as to what students will dress up as. Ugly sweaters, light-up hats, and Hawaiian shirts are always popular. After school will be the Powderpuff game at 5:00 pm between the juniors and seniors, where the girls play football and the boys cheer. The seniors are out to defend their title and hopefully emerge victorious for the second year in a row. After the game will be the Taste of East from 5:30 to 8:00 PM, a showcase of clubs with the appearance of several food trucks. Students can walk around, fundraise for their clubs, and purchase a variety of food and beverages. After the Taste of East, there will be the annual bonfire on the front lawn, accompanied by the Amherst Fire Department. Students should have their rides pick them up promptly at 8:00. Friday is school spirit day for the underclassmen, and dress up day for the seniors. There will be a final assembly held at 1:30 in the gym. Games will be played including the Chicken Toss, and the Homecoming Court speeches will be read in preparation for the announcement of the King and Queen. Saturday is the big day, starting with the parade, which begins at the Muegel Fire Hall on the corner of Muegel and Transit at 11:30 AM. Students walk behind their floats, with the King and Queen at the front of it all. Be sure to wear your class t-shirt for the parade, and you may want to bring East apparel to change into for the football game. There will be pizza and water provided by the sophomore class and Sorrentinos restaurant at no cost, and at 1:00 the Homecoming football game begins against the Grand Island Vikings. East has won its last two Homecoming games (Sweet Home in 2017 and Kenmore East in 2016). Students are hoping that the streak will continue. The Sea of Red will proudly be supporting the team from the student section of the bleachers, complete with cowbells and homemade signs. “The pep rallies pit us against each other, but the game unites us,” commented sophomore Ethan F.
Saturday night is the dance from 7:00-10:00 PM in the gym. There will be refreshments and water provided to the students and a coat check for those who wish to store their belongings. Students should have their rides arrive promptly at 10:00. Homecoming week is a cherished event here at East, and we hope that next year will be just as successful as this year was.